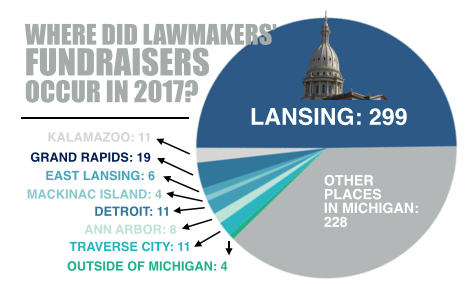 Nearly Half Of The Fundraisers Occurred In Downtown Lansing On Days The Legislature Was In Session, According To Disclosures. 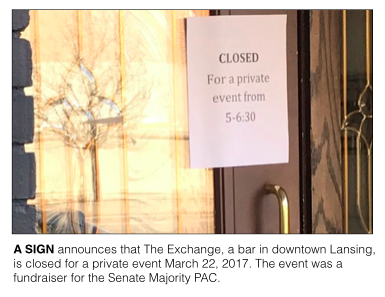 LANSING — Some days in Lansing, the fundraising begins before the lawmaking does. Take Wednesday, March 21, for example The first state House committee began at 9 a.m. The first fundraiser was scheduled to begin at 7:30 a.m.
By 10 a.m. Wednesday, a donor could have gone to fundraisers for five different state House members, according to invitations posted online. Inside a single office building, the Michigan Credit Union League was hosting a reception for Rep. Sue Allor, a Republican from Wolverine, on the fourth floor, and the Michigan Health & Hospital Association was hosting an event for Rep. Terry Sabo, a Democrat from Muskegon, on the 12th floor. In total, there were nine fundraisers scheduled for Wednesday — a day during which lawmakers were also crafting the state budget and debating the possibility of tying work requirements to Medicaid eligibility. All nine of the fundraisers took place within walking distance of the Capitol. Days like Wednesday aren’t unusual in Lansing where legislators face increasing pressure to raise money. According to a review of campaign finance disclosures, state elected officials reported having 601 fundraisers during 2017, a significant increase compared with previous years. In 2016, state elected officials reported 439 fundraisers, according to MCFN's tracking. In 2015, the total was 315. The jump last year could be because 2017 leads into an election year, 2018, when Michigan voters will choose a new governor, a new attorney general and a new secretary of state. Voters will also select candidates to fill all 148 seats in the state Legislature. The cost of campaigns like these has been trending upward. The 2016 races for the Michigan House were the most expensive on record with seven individual races costing more than $1 million. The last time all 38 state Senate seats were on the ballot, Michigan saw the most expensive individual Senate race in state history. That race cost about $2.6 million. Some of the money that supports these campaigns is collected at fundraisers where lawmakers, candidates or other groups ask people to make a contribution in order to attend. When it comes to incumbent officeholders, many of the events take place in downtown Lansing on days the Legislature is in session. This setup allows those raising money to meet interest groups where their representatives are. There were about 100 days in 2017 when either the Senate or the House was scheduled to be in session. Of the 601 disclosed fundraisers, 282 of the events — or about 47 percent — occurred on session days within walking distance of the Capitol. MCFN tracked fundraisers reported to the state by officeholders’ campaigns, by PACs the officeholders raise money for and by committees that raise money on behalf of the four legislative caucus committees. Those caucuses are the House Democrats, the House Republicans, the Senate Democrats and the Senate Republicans. The 601 events reported raising $10.4 million in 2017.
Who Had The Most Fundraisers In 2017? Attorney General Bill Schuette, a Republican from Midland who is running for governor, had the most fundraisers of elected state officholders in 2017, according to campaign finance disclosures. His attorney general committee and gubernatorial committee combined to report 38 fundraisers. Another gubernatorial candidate, Lt. Gov. Brian Calley, a Republican from Portland, reported having 18 fundraisers. He was tied with Rep. Jon Hoadley, a Democrat from Kalamazoo, who reported 18 fundraisers. Of those 18, Hoadley reported having 13 house parties around the state that were listed as fundraisers. The highest grossing fundraisers were held by the Senate Republicans, the House Republicans and Schuette. The Senate Republican Campaign Committee reported having a reception at the University Club of Michigan State University on May 3. The committee said the event raised $587,620. Less than two weeks later, the House Republican Campaign Committee reported having a golf and dinner event at Eagle Eye Golf Club in Bath Township north of Lansing on May 15. The committee reported that the event raised $513,200. Schuette’s attorney general committee reported raising $429,500 at a reception in Midland on Sept. 7. Three addresses in downtown Lansing combined to host more than a third of the 601 fundraisers in 2017. 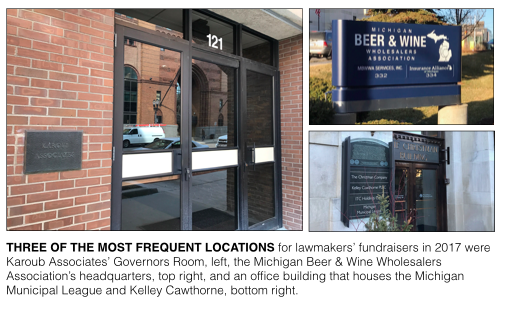 Officeholders reported having 81 fundraisers at 332 Townsend St., the home of the Michigan Beer & Wine Wholesalers Association’s downtown office. Officeholders also reported having 55 fundraisers at 208 N. Capitol Avenue, an office building that is home to the Michigan Municipal League and the multi-client lobbying firm Kelley Cawthorne.